The CGS ancestral chart collection is an eclectic mix of styles and materials that represent families from a variety of times and places. Unrolling one is always a surprise; you never know what you will find. Lavinia Schwarz opened a chart and was startled to find it was her mother's CRESAP family. She had known of its existence but had never before seen a copy. But one chart literally brought the proceedings to a halt as everyone gathered round to admire it. 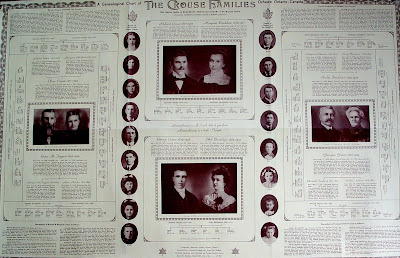 "The CROUSE Family Chart with Related Families of Bradshaw - Grieve - McTaggart in the Napanee District showing the Ackerman, Fairbairn, McLeod & Morden connections" is a genealogical treasure and a work of art. The chart is perfectly symmetrical in form and content, due to the featured sibling marriages: two CROUSE brothers who married BRADSHAW sisters. The chart is divided into thirds. The center panel contains the names, dates, biographical information and photographs of the subject couples. The left panel gives the ancestry of the Crouse brothers; the right panel traces the lineage of the Bradshaw sisters. Two columns of oval portraits of the couples' siblings separate the panels, Crouse on the left, Bradshaw on the right. The subject couples are (top) Richard Crouse (1877-1922), who was the eldest child of his family, and wife Margaret Bradshaw (1878-1961); (bottom) George Crouse (1879-1948) and Ethel Bradshaw (1883-1919). Also included are the names and birth dates of their children. The left panel of the chart features Oliver Crouse (1851-1924) and Emma McTaggart (1855-1929) and lists the names of their 12 children, their full birth and death dates, names of spouses (or if unmarried). The left side also includes the names of the family members of the previous two Crouse generations and one generation of the McTaggarts. The very top of the left panel of the chart is a biography of the earliest named Crouse, "Oliver CROUSE (1777-1841) the Yeoman" who is the great-grandfather of the two featured brothers. "According to tradition, Oliver Crouse was a tall, slim, fair, adventurer born in the U.S.A. of Dutch descent. As a young man he settled in the Bay of Quinte area in the early 1800's." A full description of his land records, marriage to Maria Nestor, service in the War of 1812 and death are contained in the account. The right panel of the chart describes the family of the featured sisters - Charles Bradshaw (1852-1926) and Georgina Grieve (1852-1929), their children, the two previous Bradshaw generations and the parents and siblings of Georgina (Ina) Grieve. The top of the panel is the biography of David Bradshaw (1798-1869) "the Pioneer." The bottom central portion of the chart reads "Lithography = Mortimer Limited, Ottawa, Ontario. Reproductions - Pontiac Printshop Ltd., Shawville, Quebec. Compiled, Designed and Published by Charles Gordon Crouse, Shawville, Quebec - March 1967 - this is No. ____ of 300." The number was not written in. Photographs courtesy of Colleen Huntley. You don't have to be related to this family to marvel at both the design and content. Thanks to today's technology and the efforts of the society we all can enjoy this delicious treasure. Thanks for your comments and for your technological advice. CGS has a library full of amazing holdings just waiting to be blogged about. Thank you so much for contacting me and for the close-up of Oliver Crouse's history. Oliver is my husband's 4th great grandfather. We met Charles Gordon Crouse, the author of this beautiful work, in 1982 when he visited the U.S. on research. I would love to correspond with descendants of the Crouse Family. I hope someone finds your information and interest in the CROUSE family through the blog. Let me know if they do! Thanks for stopping by and leaving a comment. I hope you will contact Rhonda Nipper who left a comment in 2008. How great that this is a way for cousins to connect!